Put everything into a heavy saucepan, bring to a boil, reduce to a slow simmer, cover, and cook for two hours or more, stirring occasionally until a thick paste. Remove from heat, cool, and puree in a blender. Makes 3 jars of chutney which is also a fabulous sauce for steaks. As a lifelong addict to knackebröd, a little chutney, flat parsley, plain yogurt and sliced raw asparagus is a tasty, flavorful breakfast. Last night, I used the chutney on a steak . This is a sweet, sour, and spicy sauce. 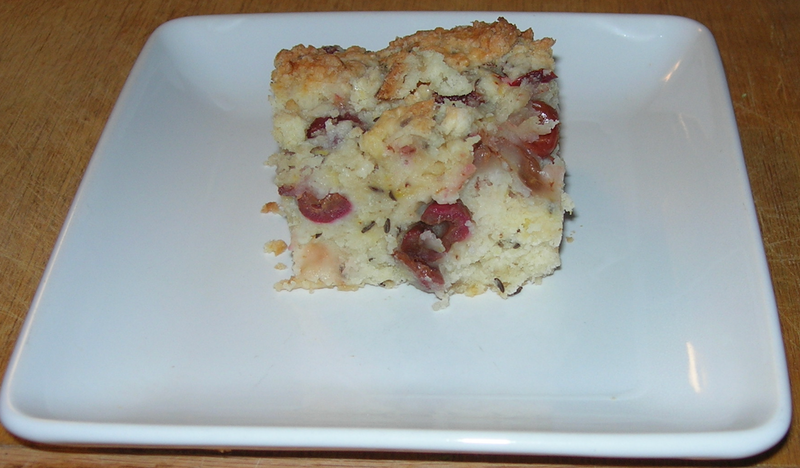 It’s based on Major Grey’s Mango Chutney, but I substituted dried figs for raisins. (I like nearly every other dried fruit more than raisins.) I left out the garlic and used seasoned rice vinegar rather than cider vinegar. That was because I was out of cider vinegar, but it does add a deeper flavor. I pureed in a blender rather than leave it chunky, which is the more traditional way to serve it. This is because I was thinking of using it as a base for a salad dressing, which you can see in my next recipe. Heat oven to 400 degrees Mix dry ingredients in mixing bowl. Cut in pieces of butter using a pastry blender. Add applesauce and sour cream and mix. The batter will be more solid than cake batter, but not stiff and dry like scone batter. Add optional nuts and dried fruit. You can experiment with different nuts and fruits, including currants, raisins, pecans, walnuts, or pepitas. 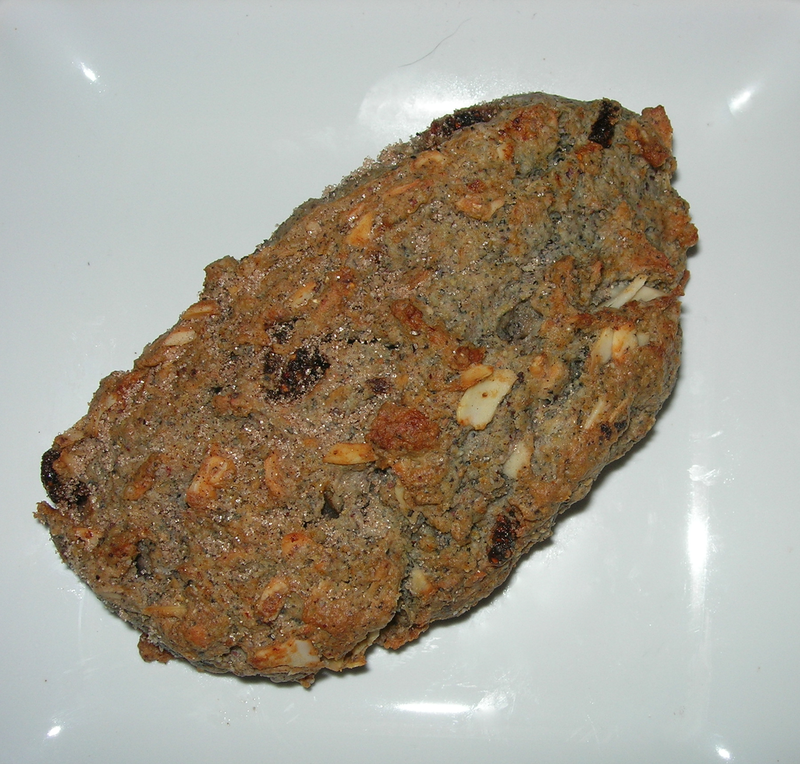 Roll into a log using parchment paper or wax paper. Then slice into 12 pieces and layer on parchment paper on a cookie sheet. Bake 15 minutes at 400, remove for a moment, shake some mixed cinnamon and sugar over the top and return to oven, lowering temperature to 300 for 15 more minutes. 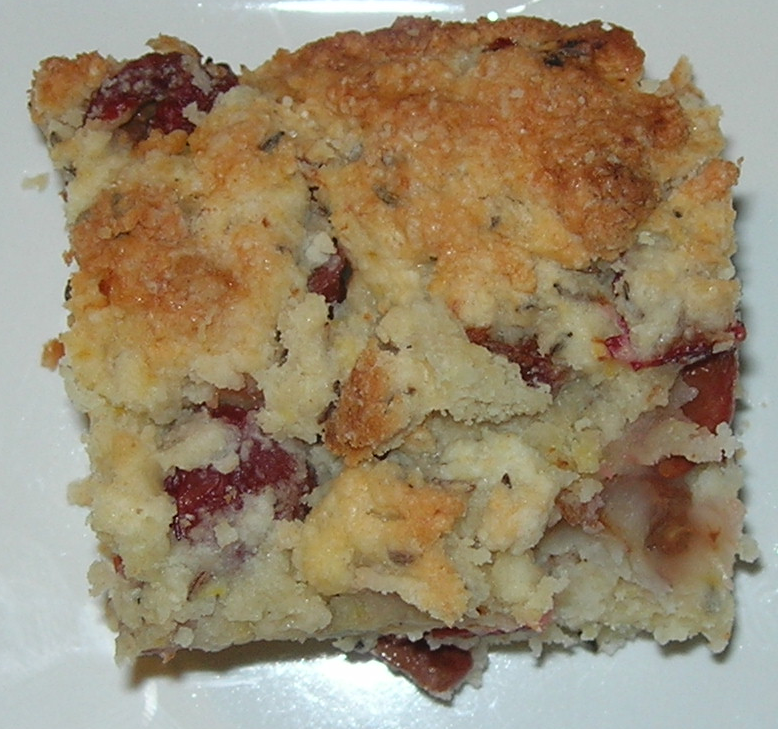 These are a nice moist, breakfast/dessert bars. They are toothsome, hearty, and slightly sweet. Goes well with coffee or tea. A good afternoon snack. 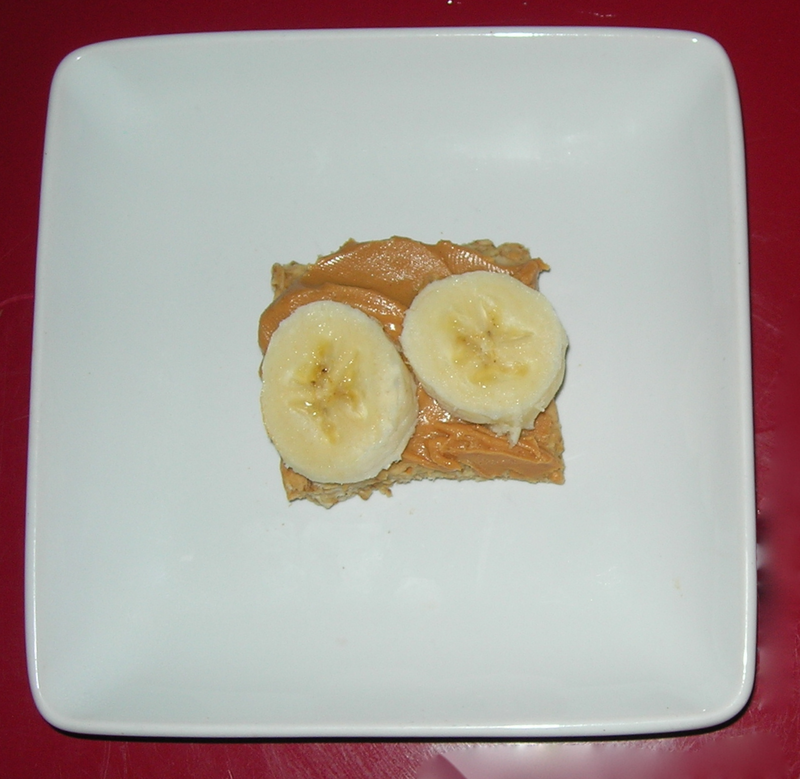 They’re not as sweet as dessert bread, but not as “healthy” as corn muffins. Smörgåsbord is a way of life for Scandinavians and open-face sandwiches and snack crackers like rye crisp are part of that tradition. 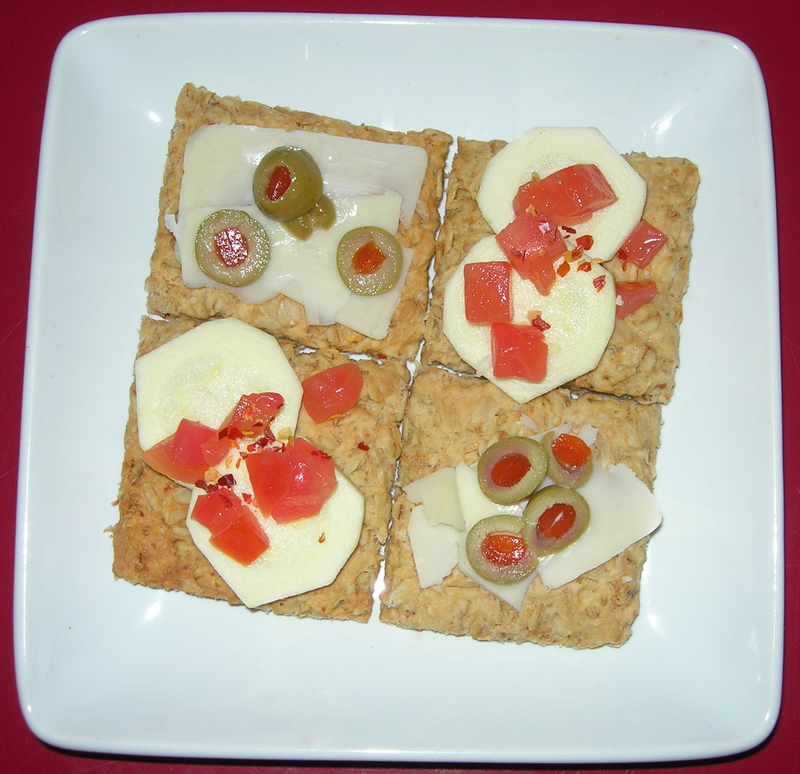 These are my aunt’s oatcakes that make a delicious snack cracker sandwich. Layer parchment paper on a cookie sheet and spread out the dough, pressing it flat to 1/4 inch. To get even edges, fold up the parchment paper and press until it is evenly flat. It will fill the entire cookie sheet so it’s nice if you use one with edges. I used a pizza cutter to cut into 24 squares before baking because it will crumble if you cut it later. The pizza cutter won’t pull the dough, so it’s easier than a regular knife. I baked for 40 minutes, until it began to brown and then let it cool. It will crack apart where you cut. The oatcakes are delicious plain, a bit of nutty crispness. 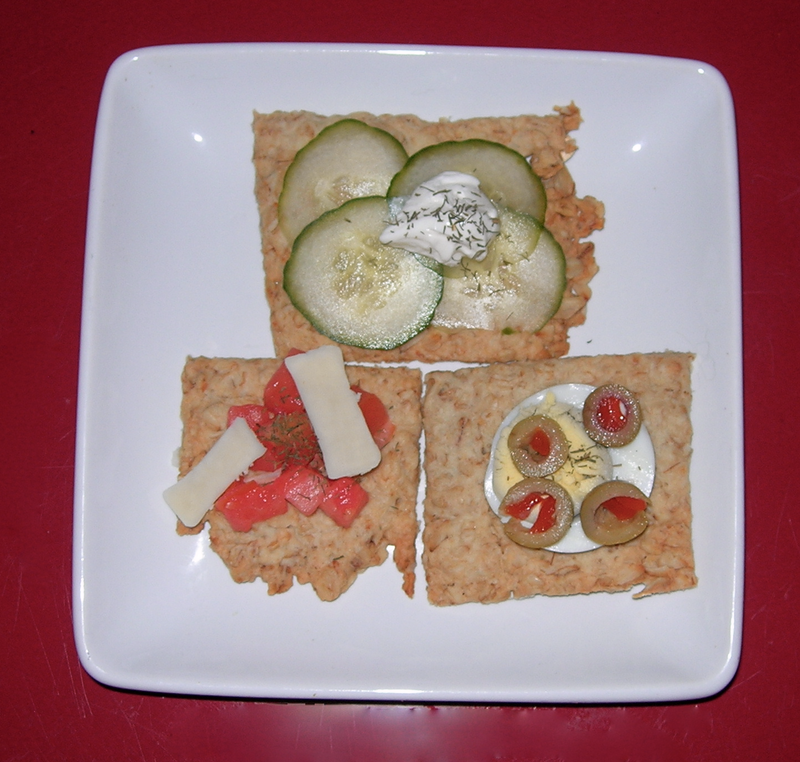 However, oatcakes are also a fantastic base for snacks. Why three cucumber salads in one post? Because I got 15 pounds of cucumbers from the Food Bank’s Harvest Share program and cucumbers do not keep that well without some vinegar. So, I spent a long time slicing and dicing and mixed up three huge salads. Two of them based on my mom’s delicious old-fashioned cucumber salad. This is mom’s recipe. Slice your cucumbers no more than 1/4 inch thick. I used a mandoline and easily sliced wafer thin slices. Layer the slices in a container with high sides, lightly salting between layers. I used Glad’s 13 cup family size container which held about 8 -10 large cucumbers, sliced. I put a sheet of wax paper over the container and set my cast iron fry pan on top of the wax paper and then put my tea kettle on top of that so it was weighted down heavily. I left it for a few hours and came back to add the dressing. After two hours, I dumped the cucumbers into a big colander and let them drain. Rinsing the Glad container to get the saltiness out, I mixed the dressing right in the container while the cukes drained. I used 2 cups of white vinegar, 1/4 cup of sugar, 1 TBSP of dill weed, 1 tsp of garlic salt, and 2 tsp of celery seed. I squeezed the juice out of the cucumbers, added them back into the container with the dressing and refrigerated overnight so they absorbed back the fluid I had drawn out with salt. Now they are saturated with a fresh dill flavor that has a mild bite. Makes 10 cups of salad. I only made about 7 cups of this salad because I used oil so it won’t last as long. To make it I cut the cucumbers into 4-6 inch long lengths that I shredded on the mandoline, making threads of cucumber. I also sliced and diced finely two purple onions. I salted and let rest for about an hour. Squeezing out the excess, I grated the zest of two limes over the salad, mixing it in. Then, squeezed the lime juice into a sauce bowl for the dressing. I added 3/4 cup seasoned rice vinegar, 1/4 cup light olive oil, 2 TBSP of soy sauce, salt, pepper, and 2 tsp of red pepper flakes. 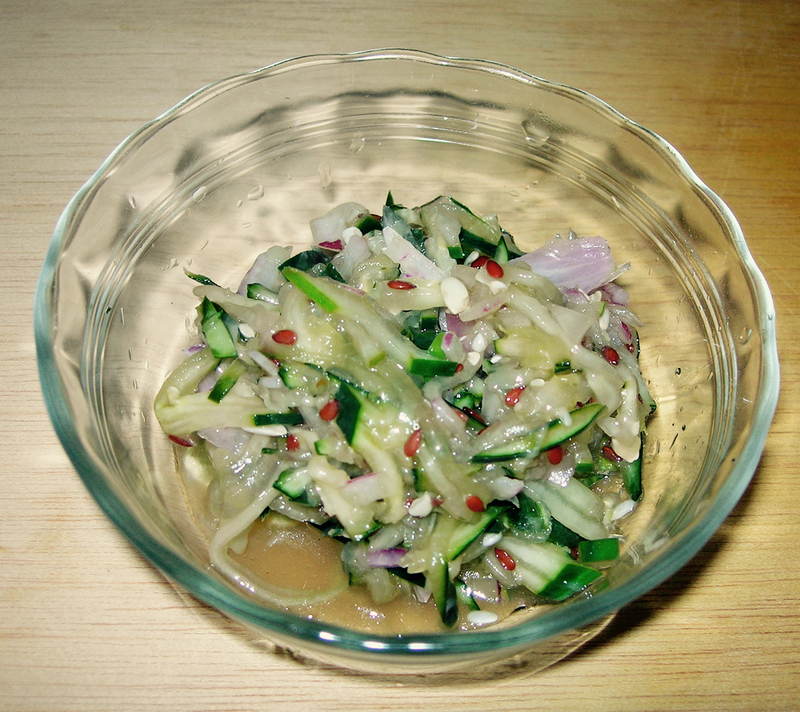 I poured on top of the cucumber and onions, shook and let sit to absorb flavors for a few hours. This is a spicy, tangy salad with that delicious earthy tang of limes and the heat of peppers. It’s delicious on a sandwich with pulled pork. Makes six cups of salad. 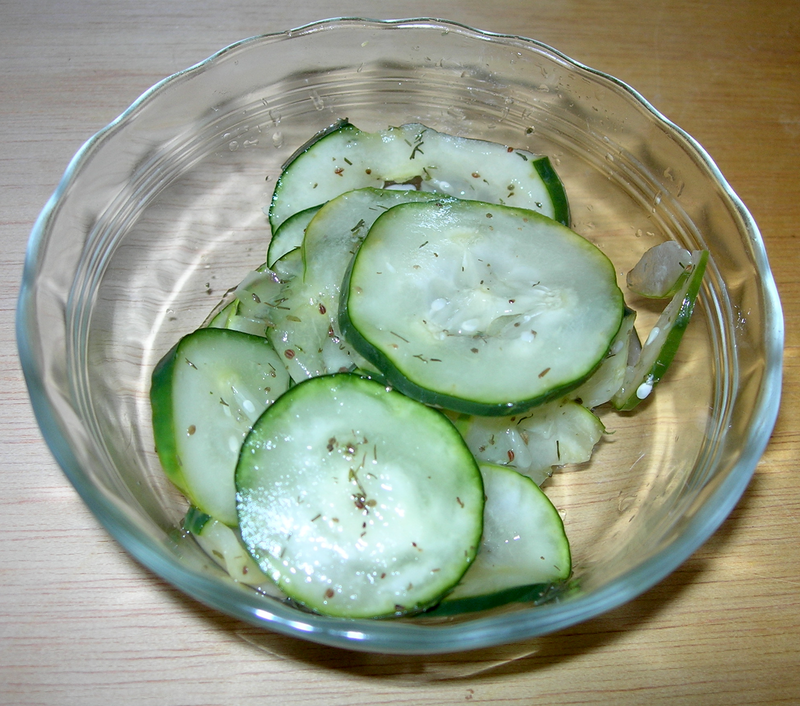 These are pepper-salted cucumber slices, also a recipe from my mom. As before, I sliced the cucumbers, layering with salt until I filled the 13 cup container. I added weight on top of them and let them sit for two hours to draw out the liquid. I drained them in a colander, squeezing out all the liquid I could. In the 13 cup plastic container, I added 2 cups of vinegar, 1/4 cup of sugar, and 1 TBSP of pepper. I mixed together, Added the cucumber and let it soak up the vinegar overnight. This has a fresh vinegary taste with a bit of bite from the pepper, fresh and cool followed by just a bit of heat. Makes 10 cups. I made these last month when it was too hot to turn on the oven, but wanted to make an apple dessert. 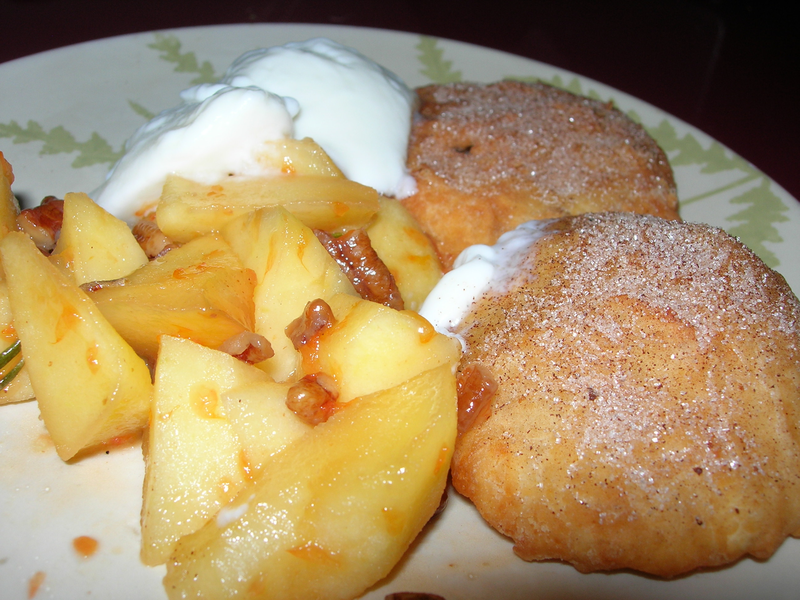 I decided to make some fry bread with apples and yogurt. To make the fry bread. Heat vegetable oil in a deep pan. Use plenty of oil (1 or 2 cups), you can strain it through a cheese cloth and use it again. Mix together and form into four rounds. Drop into the oil, one or two at a time, depending on the size of your pan. You want plenty of space. When one side is done, flip it over and fry on the other side. Remove and rest on paper towels to drain, sprinkle with cinnamon and sugar. So, these are slightly savory apples. I put 1/2 TBSP of butter in a pan with some sliced red onions and a few rosemary leaves. 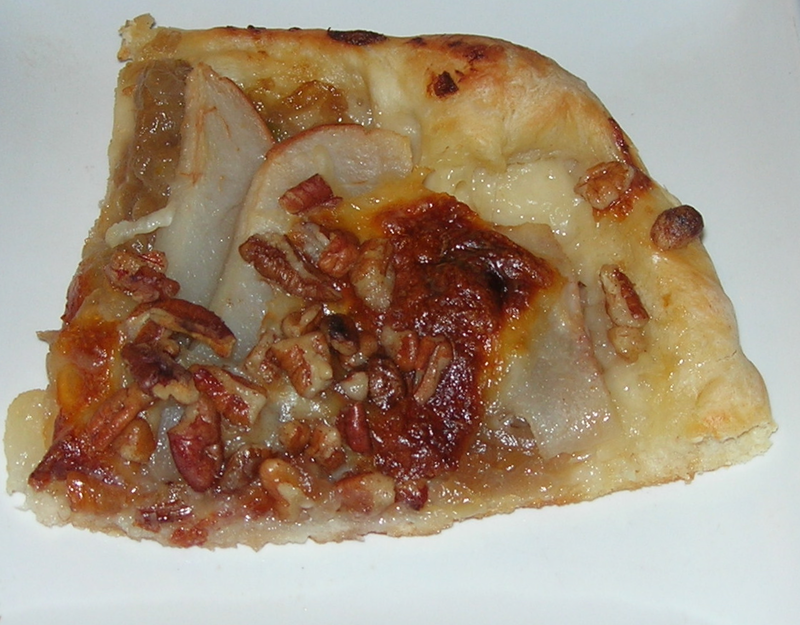 I added two apples, peeled and sectioned, and cooked until tender but not mushy, adding a TBSP of sugar at the end to sweeten the onions a little bit more. I served half the apples with two fry bread and a spoonful of yogurt. This made two servings.